HARTFORD, CT (Tuesday, July 31, 2012) – The Connecticut Convention Center’s associate recognition luncheon was extra special this month. 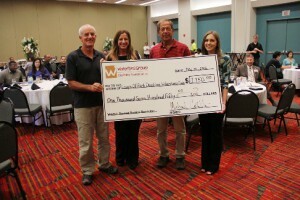 A donation was made to Leaps of Faith Disabled Waterskiers Club on behalf of all the Convention Center associates. In April, the Connecticut Convention Center associates participated in the Waterford Charitable Foundation’s Annual Bowl-A-Thon to raise money for a charity of their choice. Leaps of Faith was discovered by one of the Convention Center’s own, Urszula Dudzic, who shares a strong passion for this organization. The Leaps of Faith Disabled Waterskiers Club is an organization that brings water skiing into the lives of children and adults with disabilities. Not only do these children and adults waterski for pleasure, but they also are trained to compete on national and international levels. The organization is staffed with over 50 volunteers who contribute to the overall goal, which is “to build lasting confidence and fulfillment through exposure and professional training in recreational and competitive water skiing to both disabled children and adults.” On behalf of the Connecticut Convention Center, Amanda Schoonmaker, Waterford Charitable Foundation liaison, and Urszula Dudzic, Environmental Services Manager, presented the $1,750 life-size check to David Bennett and Joel Zeisler from Leaps of Faith. The Connecticut Convention Center in Hartford is the state’s premier meeting venue and the largest full-service convention facility between New York and Boston. Overlooking the beautiful Connecticut River, it features 140,000 square feet of exhibition space, a 40,000-square-foot ballroom and 25,000 square feet of meeting space, as well as ample sheltered parking. The facility is served by more than 6,000 area hotel rooms, including the 22-story Marriott Hartford Downtown, adjacent to the Convention Center. The venue is professionally managed for the State of Connecticut by Waterford Venue Services, an affiliate of Waterford Hotel Group. For more information, please visit www.ctconventions.com.